Transactional replication – Transactional replication replicates each transaction from publisher to subscriber for the article/table which is being published. Initially transactional replication takes a snapshot of the publisher database and applies to the subscriber to synchronize the data. As we know that replication is helpful to synchronize the data among the Publisher and subscriber databases. 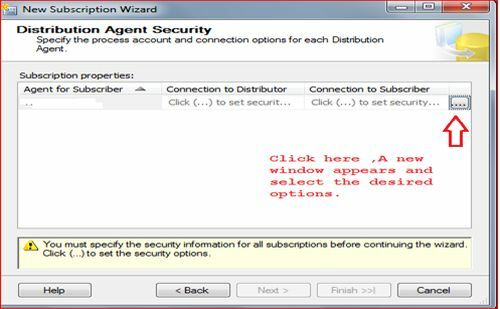 A Log Reader Agent reads transaction from the transaction log and writes it to the distribution database and then to the subscriber database. Each database published using transactional replication keeps Log Reader agent and moves transaction from publisher to distributor. Transactional replication is helpful where real time data is required such as online trading and bank specific transactions to keep live data backup of each debit or credit transaction. Note: I also noticed that transactional replication applies only on those article/tables which has primary key in it.This is the only reason it keeps track of data changed at publisher level. Snapshot replication - Snapshot replication works slightly different in manner from transactional replication. 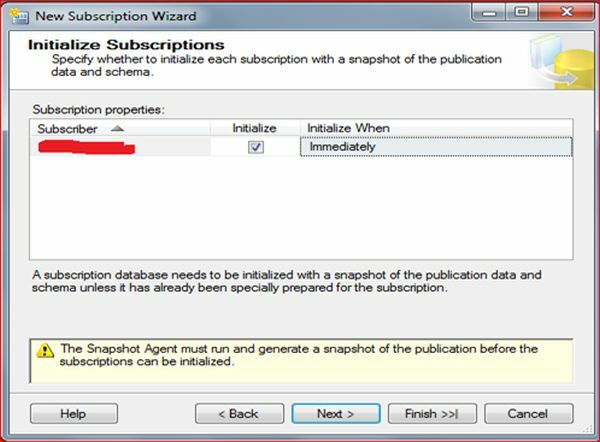 As name “snapshot” says it takes a snapshot of the published database and moves it to a subscriber database. Snapshot replication completely overwrites the transactions/data at the subscriber database every time as it drops the tables and recreates it again. Snapshot is best in use when data frequency is bit low or subscriber needs data on a certain interval rather than very frequently. E.g. Snapshot replication is to update a list of items that only changes periodically or at certain interval like end of business day. Snapshot is bit slowly than transactional because on each attempt it moves multiple records suppose millions of records from one end(Publisher) to another end(Subscriber). Merge replication – As name implies “Merge” it joins publisher and subscriber databases, it is one of the complex replication and helps to keep data consistent among multiple ends. 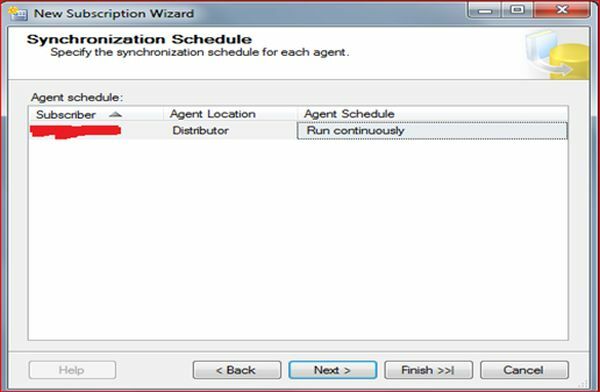 Merge replications works in an integrated manner with Publisher and subscriber, every time Merge Agent traces each change occurred at both end and send those changed transactions to distributor database for further propagation. 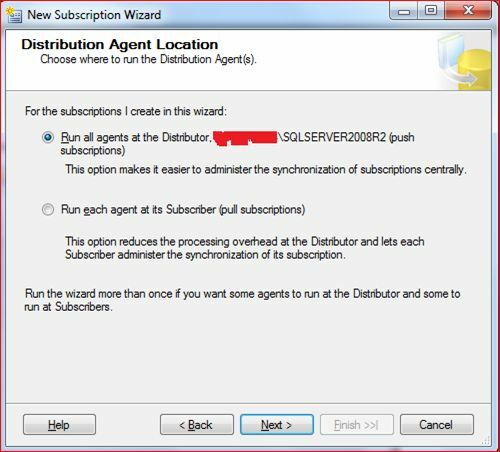 The Merge Agent runs either at distributor end for push subscriptions or the Subscriber for pull subscriptions. What I understood about Merge replication, its best fit into Retail market like Pantaloons, BigBazar Lifestyle and many more. Where it’s helpful in synchronizing the records among multiple stores as per inventory increased or decreased. To know more about Replication please go through these links. I thought to keep the pictorial concept so that anyone can easily setup and map at their end. The Publisher can be denoted as the origin of the database on which the schema or record amendments take place. Publisher is a point that manages data for replication and sends commands to the distributor for further process, for example S1. 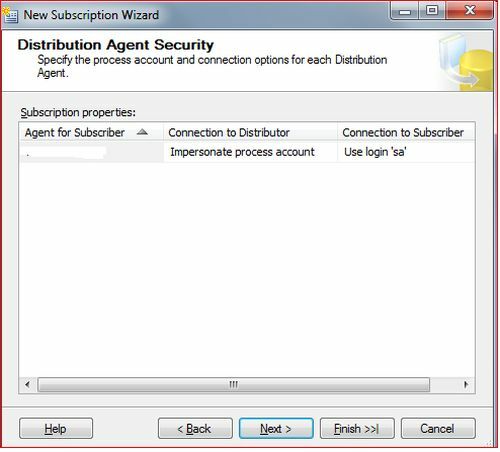 The Subscribers is the point, where the subscriber database incurs the notification and a copy of the data from the distributor about the changes happens in the publisher database. The subscriber database generally lives on a different something, for example S2. 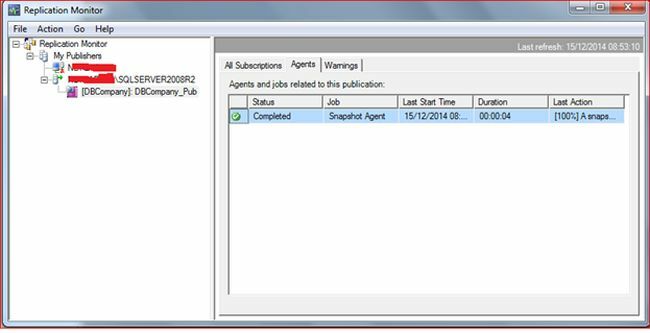 Once the publisher (Snapshot replication (Setting up publisher) in SQL Server) has been setup, it's time to create the subscriber for it. The following procedure is required to set up the subscriber. 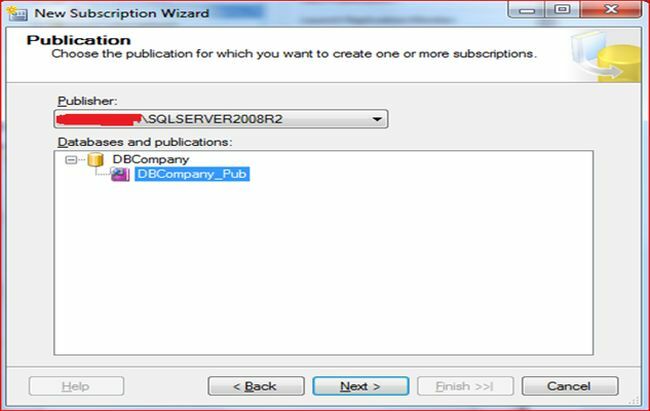 Step 1:Right-click on DBCOmpany_Pub and choose the option “New Subscription” to create a subscription. Step 2: A Publisher dropdown shows the publisher name that we have created recently in the last activity. Please refer to the image below for reference and click on the Next button. Step 3 :The following window will appear and click on the "Next" button. Step 4 : In this step we will add new subscribers that will be a different machine or the same machine where we have already set up the Publisher account (for example S2). Kindly refer to the screen captured below for a better understanding. Then click on the Next Button. Step 5 : Please see the image given below and take the necessary action. Kindly refer to the image below after clicking on the button as advised above in the image. Now choose the necessary actions in a prompted dialog box and press OK.
After fulfilling the window shown above kindly click on the Next button and proceed further. Step 6 : The following window will appear and click on "Next". Step 7 :The following window will appear and click on "Next". Step 8 :Another window will appear and click on "Next". Step 9 : The following window will appear and click on "Finish". 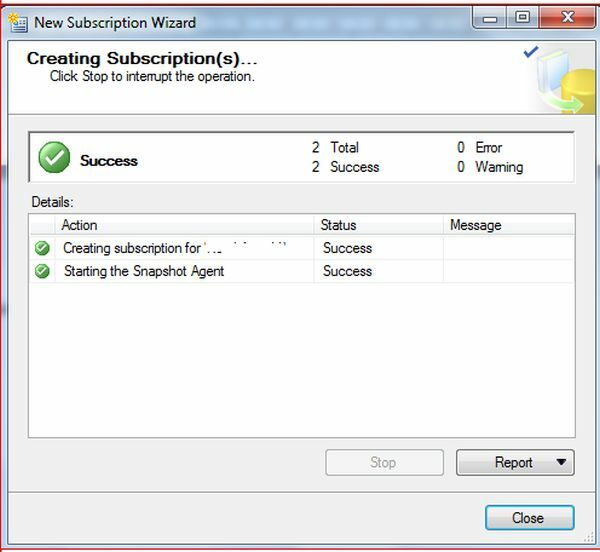 Step 10 : A window will appear with some messages for Successful creation of the Subscription. Step 11 :Expand the publisher and you can see the subscriber as shown in the image below. The Replication monitor describes to you in detail about the success or failure of the snapshot replication. You can read all the details from the three options given there. The Magic of Data replication is over. Thanks for reading this. I'll post another part soon. To learn more about MVC, please go to the following link. 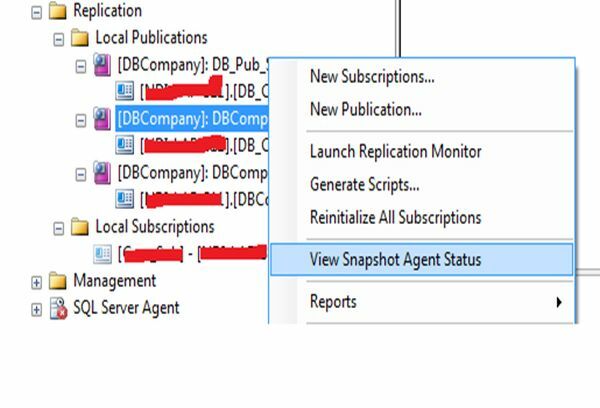 This is a continuation of the Snapshot Replication in SQL Server 2008: Part 1.In these articles I’ll shed light on Setting up Publisher in Snapshot Replication and recommend you to read an article as shown as link. I thought to keep the pictorial representation so that anyone can easily setup and map at their end. Step1.Open replication node in your database and choose an option local publication. Step2. Right click on local publications and click on new publication. Step3. After click on new publication tab the following window will appear and click on “next” button. Step4. Select the database which will act as a publisher. I’ve chosen DBCompany on my server machine and click on “next” button. Step5. A following window appears and chooses a snapshot replication option out of 4 options there and clicks on “next” button..
Step6. Select objects that you want to publish. E.g. I’ve selected employee and Incentive table which need to replicate. Kindly refer depicted image below and click on “next” button. Step7. Following window will appear and click on “next” button. Step8. Kindly checked (tick) both of the checkbox .In order to change the schedule time interval than click on change button and set the time as per your need also shown in depicted image below in and then click on next. Step9. Following window will appear after click on “Change” button .Please set an interval accordingly and refer an image shown below and then Click on Ok button. Step10. Click on security settings button and choose options from there as shown in image below after this image . Step11. After putting up required value in above image a following window will appear. Kindly press next button to proceed further. Step12.A following window will come in and click on Next button. Step13. Kindly fill Publication name textbox with your desired name and click on Finish button. Step14. A following window will appear for Successful creation of Publication. I’ve run this under the SQL server agent account as you have seen above and also shown in image below.You can try it with Windows account also. 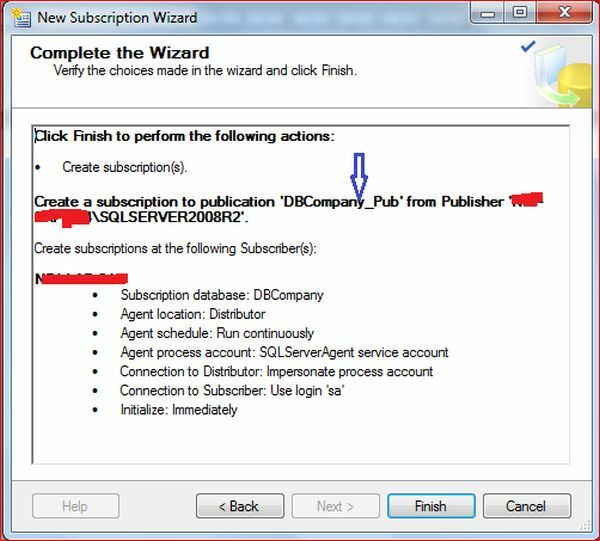 Also there is another point for consideration that, Kindly enter publisher SQL server account credentials of in order to connect with publisher database. Thanks for reading this. I’ll post other part soon. Replication is one of the headstone features of SQL Server to keep data synchronize among various server. There are basically three types of replication present in SQL server Transactional,Snapshot and Merge Replication .In this article I’ll cover Snapshot Replication. As name implies “Snapshot” means it takes a snapshot of publisher database when any occurrence such as Insert, update, delete and merge (Part of DML) or Create, Alter, Drop, Truncate (part of DDL command) happens on a publisher database resides on server(e.g.S1) and needs to be reflected/replicate on the database residing on another server (e.g. S2). This change happens within fraction of seconds. In this article, I will demonstrate the step by step approach to configuring snapshot replication in SQL Server 2008 R2. A database which contains all the Replication commands. Whenever any occurrence such as Insert, update, delete and merge (Part of DML) or Create, Alter, Drop, Truncate (part of DDL command) are executed on the publisher, the corresponding commands generated by SQL Server are stored in the Distribution database. Note: it’s best if we can maintain this database at shared path in such a way that the distributor is responsible for sharing data among the subscriber, I have also observed that if you keep the distribution database on the shared path than I would be convenient for another server to access that path easily otherwise it may prompt an security denied access error. Note: Distribution database can be placed on the same server as the publisher however its best practice to keep it on different server e.g. S3. Let us now begin with the snapshot Replication and will cover Setting up the Distribution Database. 1. Setting up the Distribution Database. Step1. Connect to the Microsoft SQL Server 2008 R2 Management Studio. Step6: Create a folder on any other drive/server to hold the Snapshot folder and Click on the Next button as shown in the screen depicted below. Note: Snapshot folder should not be in C drive or in that drive which has OS. E.g. SnapShot Folder- -> \\servername\path to respective folder. Step7: A new window appears as shown in the screen capture below and display information to store data and log file. Step8: A new window appears as shown in the screen below and Click on the Next button. Step10. Click on Finish button. As soon as I click on Finish button it takes few seconds to completes its process and give you success wizard .After completing this step you will see an entry in master database for distribution DB as depicted below. Step11: A following window represent that distribution point has been created in master.